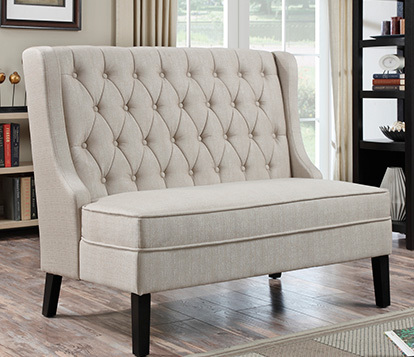 Tufted furniture – it’s a classic furniture style that has never quite gone away. Tufting happens during the upholstery process when layers of fabric are pulled inward (often with a button) to create the tuft, giving off a “buttoned-up” look. Tufted furniture originated in historic France and England (around the 1300s-1400s) and was one of the ways upper classmen would show off their money as tufting requires more fabric than other upholstery methods. Back then, these fabrics were usually rich velvets or silks but today tufted furniture comes in a variety of different fabrics with bright colors and fun patterns to combine old and new styles. 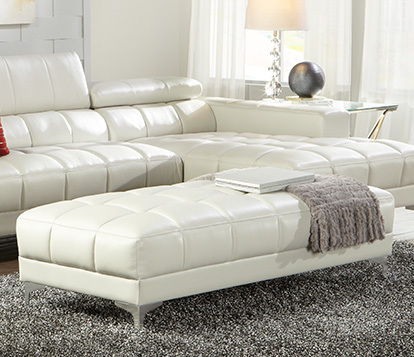 You’ll often find the tufted look on the Chesterfield sofa, Barcelona chair, and classic chaise lounges and ottomans. Tufted furniture has the ability to upgrade any room with a more upscale look, for both traditional and contemporary rooms alike. The Brittney ottoman is a more traditional approach to tufting, with a neutral velvet and classic wooden legs. Whereas the Casino IV chair shows how even modern mid-century can be glammed up with bonded leather and metal legs. Almost every design style has its own version of tufted furniture – whether you love shabby chic, modern, and glam. One of the key benefits to tufted furniture is its longevity. Since this furniture type is tightly upholstered with reinforcement every couple of inches (the tufts), it has less fabric sagging over time. So you can have an elegant look that lasts. We love these tufted rooms!